She was the daughter of John Woodward Jr. and Sarah Elizabeth Bunker. 1880 United States. Census Office. 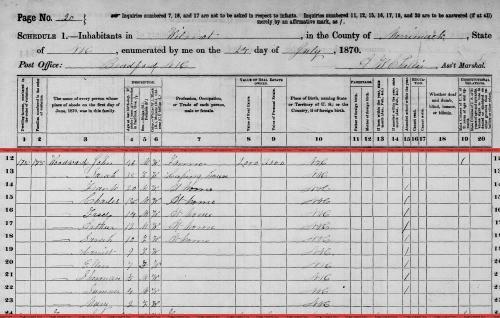 10th census, 1880 federal population census, Washington, District of Columbia: National Archives and Records Service, ([19--]) , FHL Film 1254766; National Archives Film T9-0766; Page 504C. 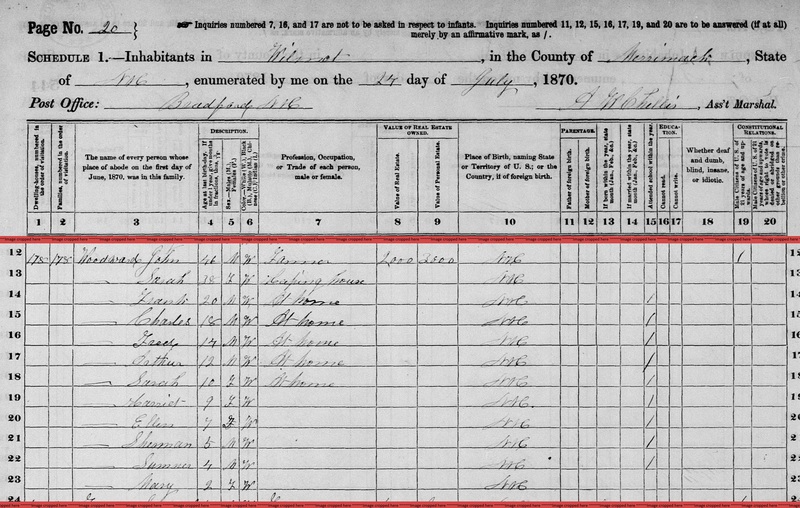 "United States Census, 1880," database with images, FamilySearch (https://familysearch.org/pal:/MM9.3.1/TH-1951-25149-30794-34?cc=1417683 : 24 December 2015), New Hampshire > Merrimack > Wilmot > ED 195 > image 17 of 22; citing NARA microfilm publication T9 (Washington, D.C.: National Archives and Records Administration, n.d.). She was the daughter of Clarence Elliot Woodward and Marietta Clark Ames. living at 58 Warwick Rd., Melrose, Massachusetts. 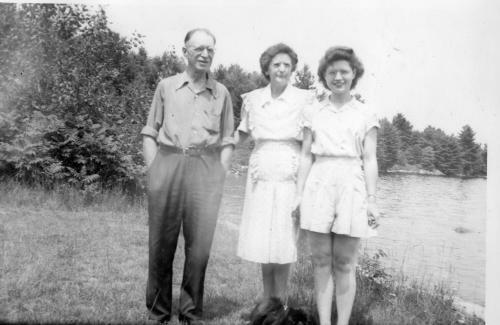 Kendall, Reginald B (Helen) clerk First National Bank (Boston) house 58 Warwick Rd. 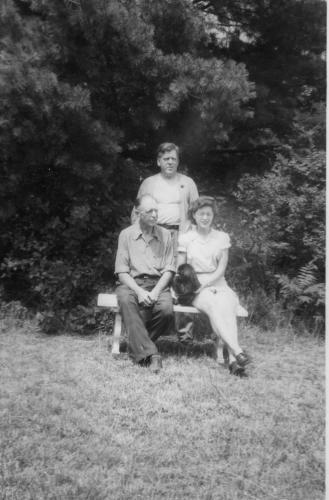 Kendall, Reginald B (Helen) clerk Gulf Refining Co. house 160 Howard. Kendall, Reginald B (Helen) salesman. resides 4 Lakecroft Ct.
living at 119 W. Wyoming Ave., Melrose, Massachusetts. Kendall, Reginald B (Helen W) salesman 971 Commonwealth Ave. house 119 W. Wyoming Ave. Melrose. 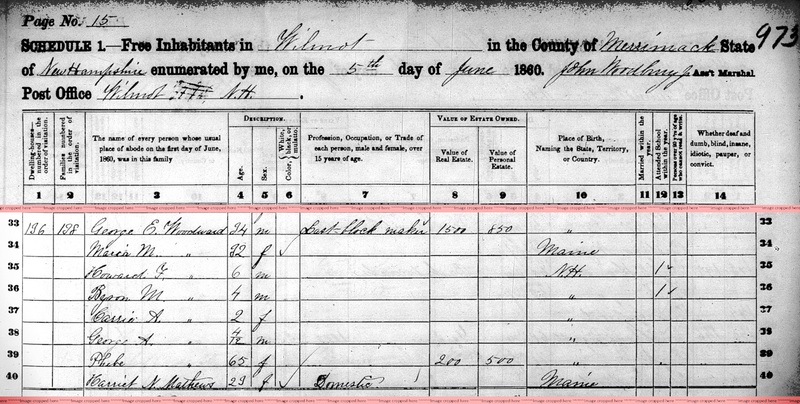 Massachusetts Birth Records, 1841 - 1915, index and images, FamilySearch (https://www.familysearch.org); from Massachusetts State Archives. “Massachusetts Vital Records.” Massachusetts State Archives, Boston. FHL microfilm. Family History Library, Salt Lake City, Utah., , Vol. 432, p. 332. Massachusetts. Boston, Passenger Lists of Vessels Arriving at Boston, Massachusetts, 1891-1943. Micropublication T843. RG085. Rolls # 1-454, Washington, D.C.: National Archives, , Microfilm Roll Number: 20. 1900 United States. Census Office. 12th census, 1900 population census schedules, Washington, District of Columbia: Bureau of the Census Micro-Film Laboratory, ([197-]) , Census Place: Melrose Ward 1, Middlesex, Massachusetts; Roll: T623 663; Page: 3A; Enumeration District: 877. 1910 United States. Bureau of the Census. 13th census, 1910 population census schedules, Washington, District of Columbia: Bureau of Census Micro-Film Lab, ([19--?]) , Census Place: Melrose Ward 1, Middlesex, Massachusetts; Roll: T624_602; Page: 11B; Enumeration District: 939; Image: 1008. 1930 United States. Bureau of the Census. 15th census, United States, 1930 federal census : population schedules ; NARA microfilm publication T626, Washington, District of Columbia: Bureau of the Census Micro-Film Laboratory, ([19--?]) , Census Place: Melrose, Middlesex, Massachusetts; Roll: 925; Page: 19A; Enumeration District: 342; Image: 774.0; FHL microfilm: 2340660. 1920 United States. Bureau of the Census. 14th census, 1920 population census schedules, Washington, District of Columbia: The National Archives, ([193-?]) , Census Place: Melrose Ward 1, Middlesex, Massachusetts; Roll: T625_715; Page: 11B; Enumeration District: 334; Image: 583. Sixteenth Census of the United States, 1940, Washington, D.C.: National Archives and Records Administration, (1940) , Census Place: Melrose, Middlesex, Massachusetts; Roll: T627_1613; Page: 4A; Enumeration District: 9-364. Selective Service System United States, Selective Service Registration Cards, World War II: Fourth Registration, National Archives and Records Administration Region Branches,. "United States Census, 1900," database with images, FamilySearch (https://familysearch.org/pal:/MM9.3.1/TH-266-12347-168481-83?cc=1325221 : 5 August 2014), Massachusetts > Suffolk > ED 1465 Precinct 7 Boston city Ward 20 > image 27 of 31; citing NARA microfilm publication T623 (Washington, D.C.: National Archives and Records Administration, n.d.). Henrietta "Penny" Woodward was born on February 6, 1921 in Melrose, Massachusetts. 1930 United States. Bureau of the Census. 15th census, United States, 1930 federal census : population schedules ; NARA microfilm publication T626, Washington, District of Columbia: Bureau of the Census Micro-Film Laboratory, ([19--?]) , Census Place: Melrose, Middlesex, Massachusetts; Roll: 925; Page: 7A; Enumeration District: 339; Image: 638.0. Sixteenth Census of the United States, 1940, Washington, D.C.: National Archives and Records Administration, (1940) , Census Place: Melrose, Middlesex, Massachusetts; Roll: T627_1613; Page: 3A; Enumeration District: 9-355. Town and City Clerks of Massachusetts, Massachusetts Vital and Town Records, Provo, UT: Holbrook Research Institute (Jay and Delene Holbrook), , Boston > Marriages, 1800-1849 > 179. Town and City Clerks of Massachusetts, Massachusetts Vital and Town Records, Provo, UT: Holbrook Research Institute (Jay and Delene Holbrook), , Boston > Boston Record of Deaths, 1878, Vol. 4 (Jan-Apr) > 47. 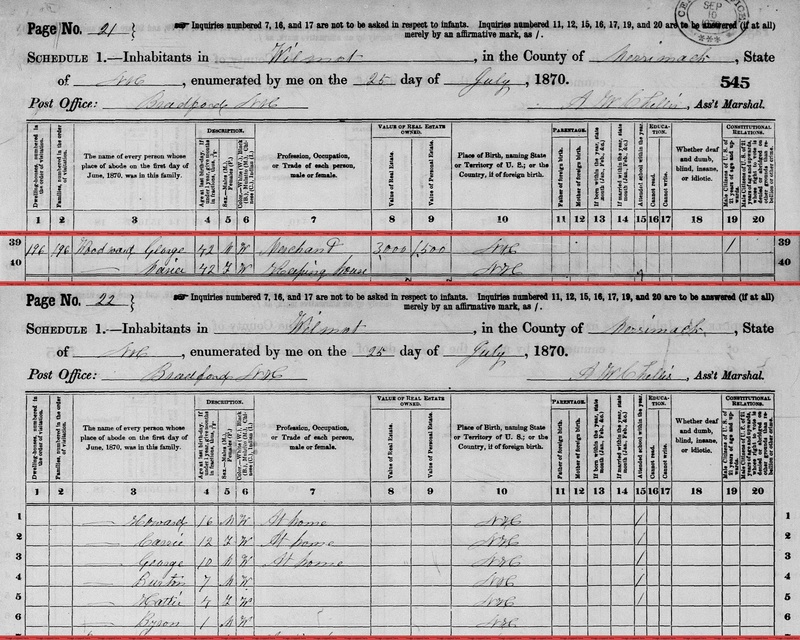 "Massachusetts, Births, 1841-1915," index and images, FamilySearch (https://familysearch.org/pal:/MM9.1.1/FXC7-JRR : accessed 22 Nov 2012), George H Woodward, 1851. "Massachusetts, Deaths and Burials, 1795-1910," index, FamilySearch (https://familysearch.org/pal:/MM9.1.1/FH8J-J68 : accessed 22 Nov 2012), Willie F Woodward, 15 Apr 1859; citing reference 83, FHL microfilm 838372. Henry E. Woodward was born on August 18, 1853 in Washington, Sullivan County, New Hampshire. He was the son of Thomas Preston Woodward and Olive Woods. 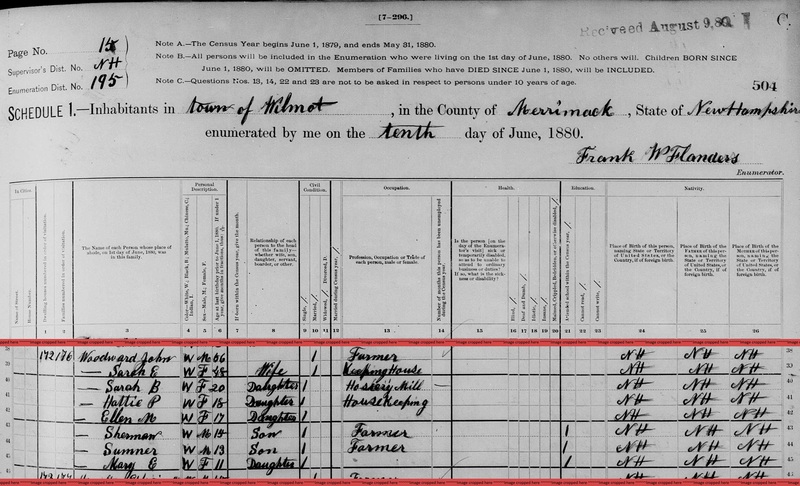 "New Hampshire, Death Records, 1654-1947," index and images, FamilySearch (https://familysearch.org/pal:/MM9.1.1/FSLV-KWG : accessed 28 Nov 2012), Thom P Woodward in entry for Henry Woodward, 17 May 1864. He was the son of George E. Woodward and Maria E. Matthews. Howard married Ella Frances Leach. In 1882, Howard Fiske Woodward was a merchant. In 1885, Howard Fiske Woodward was a canvasser. "New Hampshire, Death Records, 1654-1947," index and images, FamilySearch (https://familysearch.org/pal:/MM9.1.1/FSFV-BL8 : accessed 09 Dec 2012), George E. Woodward in entry for Howard Fiske Woodward, 27 Oct 1941. 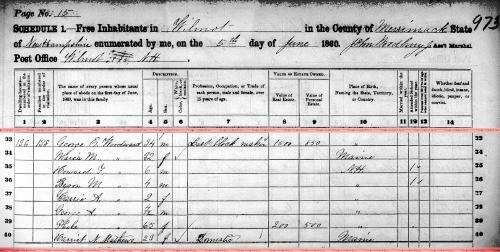 "United States Census, 1860", database with images, FamilySearch (https://familysearch.org/ark:/61903/1:1:M7W2-MMG : 30 December 2015), Carrie A Woodward in entry for George E Woodward, 1860. He was the son of Harlow Elliot Woodward and Susan Eliza Howard. 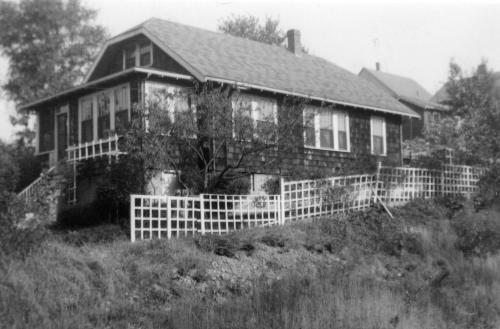 As of 1914, Howard Harlow Woodward lived at 81 Sawyer Ave., Dorchester, Massachusetts. Between 1916 and 1917, Howard lived at 114 Sawyer Ave., Dorchester, Massachusetts. Massachusetts Vital Records, 1841-1910, , Vol: 297 ; Page: 202. 1880 United States. Census Office. 10th census, 1880 federal population census, Washington, District of Columbia: National Archives and Records Service, ([19--]) , Census Place Boston, Suffolk, Massachusetts Family History Library Film 1254560 NA Film Number T9-0560 Page Number 140D. The University Council, Boston University Yearbook, Boston, Mass. : University Offices, (1899) , Vol. XXVI, p. 135. The sixth general catalogue of Sigma Alpha Epsilon, Evanston, Illinois: (1904) , p. 178. The Boston Directory, Boston, Mass. : Sampson & Murdock Company,. 1930 United States. Bureau of the Census. 15th census, United States, 1930 federal census : population schedules ; NARA microfilm publication T626, Washington, District of Columbia: Bureau of the Census Micro-Film Laboratory, ([19--?]) , Census Place: Boston, Suffolk, Massachusetts; Roll: 951; Page: 24A; Enumeration District: 382; Image: 503.0. Massachusetts Vital Records, 1841-1910, , Vol: 591 ; Page: 597. 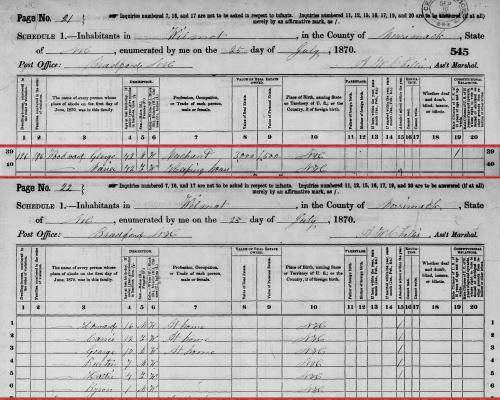 Massachusetts Birth Records, 1841 - 1915, index and images, FamilySearch (https://www.familysearch.org); from Massachusetts State Archives. “Massachusetts Vital Records.” Massachusetts State Archives, Boston. FHL microfilm. Family History Library, Salt Lake City, Utah.,. World War I Civilian Draft Registrations. [database on-line], Provo, UT: Ancestry.com, (2000) , Registration Location: Suffolk County, Massachusetts; Roll: 1685010; Draft Board: 17. 1920 United States. Bureau of the Census. 14th census, 1920 population census schedules, Washington, District of Columbia: The National Archives, ([193-?]) , 17th Ward of city of Boston, Suffolk County, Massachusetts; e.d. 434, sheet 9, dwelling 134, family 167, lines 34-38; National Archives Microfilm T-625, Roll 737. Ancestry.com, U.S. City Directories, 1821-1989 (Beta), [database on-line]. Provo, UT, USA: Ancestry.com Operations, Inc., (2011) , Massachusetts > Boston > 1933 > Boston, Massachusetts, City Directory, 1933 > 1805. Woodward, Daily Boston Globe, Boston, Mass., 22 Jul 1935. Brookline (Mass. ), Vital Records of Brookline, Massachusetts, to the end of the year 1849., Series: [Essex Institute, Salem, Mass. Vital records of the towns of Massachusetts. ], Page: 244 p. 23 cm. (n.p. : The Essex Institute, Salem, MA, 1929, unknown publish date), p. 172. "Massachusetts Births and Christenings, 1639-1915," database, FamilySearch (https://familysearch.org/ark:/61903/1:1:V5NZ-JSX : 4 December 2014), Abial Woodward, 12 Apr 1726; citing BROOKLINE,NORFOLK,MASSACHUSETTS, ; FHL microfilm 974.47 B1 V2E. From 1940 to 1942, Ina Claire Woodward was a bookkeeper at Signet Hosiery Co. Between 1942 and 1946, Ina Claire Woodward was secretary to the general manager at General Mills. Between 1946 and 1948, they lived at 34 Oval Rd., Wollaston, Quincy, Massachusetts. 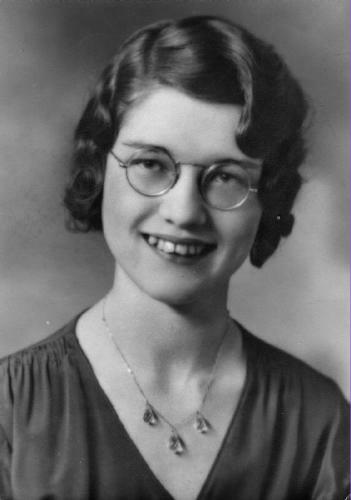 Between 1960 and 1962, Ina Claire Woodward was a bookkeeper at Viegel Manufacturing. 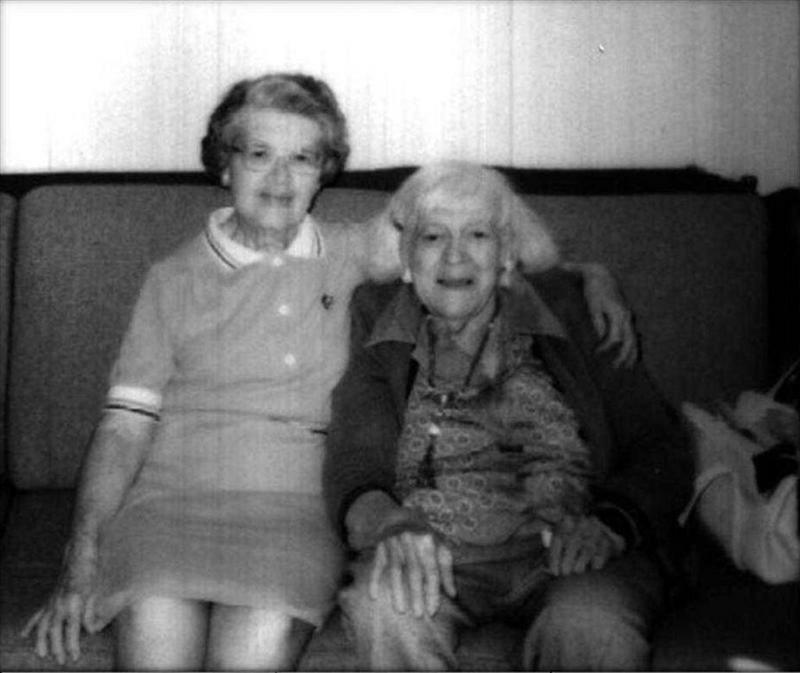 Between 1962 and 1965, Ina Claire Woodward was the legal secretary at Hillebrand Insurance Agency. 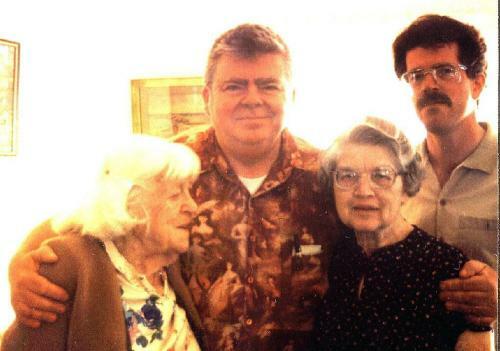 Between 1965 and 1968, Ina Claire Woodward was bookkeeper at Gilsdorf Plumbing & Heating. Between 1968 and 1983, Ina Claire Woodward was employed at Bayer & Associates (Aetna Insurance). 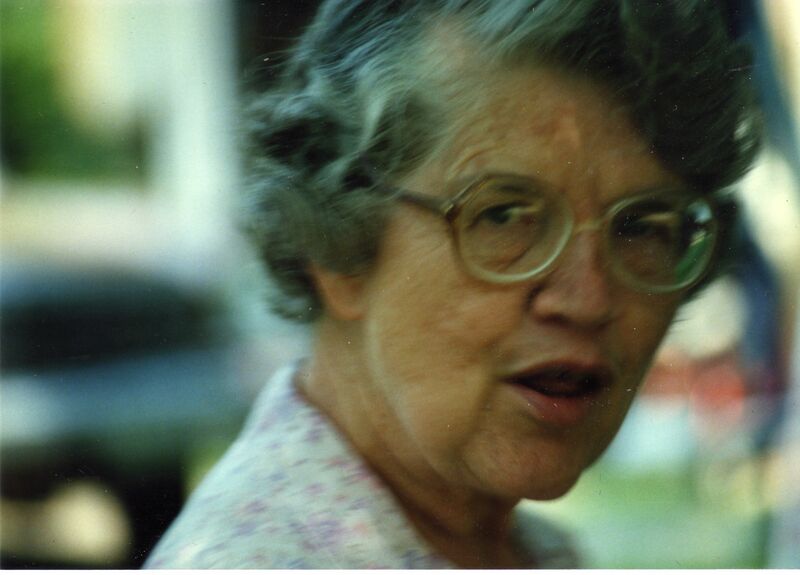 Ina died on March 9, 2008 at age 92. She was buried in Ottawa Hills Memorial Park, Toledo, Lucas County, Ohio. 1920 United States. Bureau of the Census. 14th census, 1920 population census schedules, Washington, District of Columbia: The National Archives, ([193-?]) , Census Place: Cambridge Ward 5, Middlesex, Massachusetts; Roll: T625_707; Page: 13B; Enumeration District: 54; Image: 323. 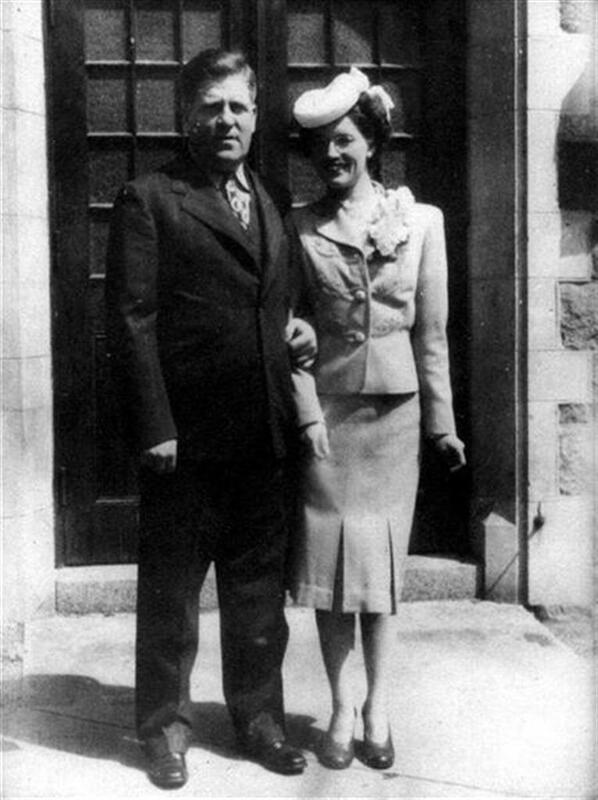 Lawrence Roys Levine marriage, 22 Dec 1946, Bethany Congretational Church, 18 Spear St, Quincy, Massachusetts. George E. Gilchrist, minister. Baby Boy Levine entry, Birth Certificate No. 156662 (27 Jul 1946), Quincy Hospital, 114 Whitwell St., Quincy, Massachusetts. Steven George Levine, Certificate of Live Birth Reg. Dist. #4801, Birth #134 (19 Jun 1957), Ohio Department of Health - Division of Vital Statistics, P. O. Box 15098, Columbus, Franklin County, Ohio. Certificate of Baptism, (10 Apr 1960), First Congregational Church, 2315 Collingwood Blvd., Toledo, Lucas County, Ohio. J. Franklin Woodward was born on June 27, 1850 in Wilmot, Merrimack County, New Hampshire. He was the son of John Woodward Jr. and Sarah Elizabeth Bunker. "New Hampshire Marriage Records, 1637-1947," database with images, FamilySearch (https://familysearch.org/ark:/61903/1:1:FLXK-R1H : 12 December 2014), J. Frank Woodward and Julia B. Crane, 29 Nov 1877; citing , Bureau of Vital Records and Health Statistics, Concord; FHL microfilm 1,001,320. She was the daughter of Robert Burns Woodward and Irja Pullman. Massachusetts Death Index, 1970-2003 [database on-line], Provo, UT, USA: MyFamily.com, Inc., ((2005)) , Certificate: 035269. 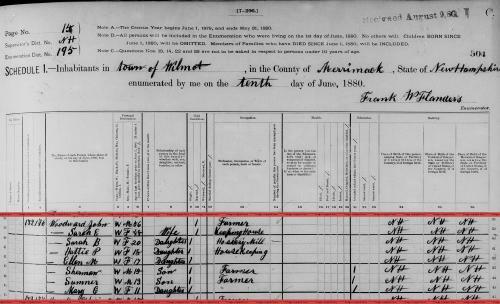 "United States Census, 1910," database with images, FamilySearch (https://familysearch.org/ark:/61903/1:1:MLZ8-51Y : 29 October 2015), Jennie M Langley in household of Austin E Langley, Wilmot, Merrimack, New Hampshire, United States; citing enumeration district (ED) ED 231, sheet 2A, NARA microfilm publication T624 (Washington, D.C.: National Archives and Records Administration, n.d.); FHL microfilm 1,374,878. Jennifer married Casey Richmond Smits in September, 2010. Jennifer Nicole Woodward is online at https://www.facebook.com/jen.smits.9. Newton (Mass. ), Vital records of Newton, Massachusetts, to the year 1850, Boston: New England historic genealogical society, at the charge of the Eddy town-record fund, (1905) , p. 224. Brookline (Mass. ), Vital Records of Brookline, Massachusetts, to the end of the year 1849., Salem, MA: The Essex Institute, (1929) , p. 129. "Massachusetts Marriages, 1841-1915," database with images, FamilySearch (https://familysearch.org/pal:/MM9.3.1/TH-266-12313-100083-72?cc=1469062 : 17 February 2016), 004279235 > image 331 of 1023; State Archives, Boston. Jessica Maureen Woodward was born in 1981 or 1982. She is the daughter of Donald Elliot Woodward and Ruth A. Bergman. Jessica Maureen Woodward is online at https://www.facebook.com/profile.php?id=2310922. She was the daughter of Abraham Woodward and Joanna Harris. Joanna Woodward was christened on August 16, 1719. Brookline (Mass. ), Vital Records of Brookline, Massachusetts, to the end of the year 1849., Series: [Essex Institute, Salem, Mass. Vital records of the towns of Massachusetts. ], Page: 244 p. 23 cm. (n.p. : The Essex Institute, Salem, MA, 1929, unknown publish date), p. 80. Brookline (Mass. ), Vital Records of Brookline, Massachusetts, to the end of the year 1849., Series: [Essex Institute, Salem, Mass. Vital records of the towns of Massachusetts. ], Page: 244 p. 23 cm., p. 241.